In the Eighties, the German and Austrian Filmservice regularly supplied driving schools, motor sports clubs, institutions, and schools with 8- and 16-mm films related to the automotive industry and road safety. Remember when films were shown at school, rolled up on metal film reels? By the end of that decade Europe had changed radically, and the two companies were expanding. Contacts were developed with other media distributors across Europe and in America, and a network of partners was built up to form Filmservice International, which today has partners in 13 countries worldwide. With the growth of cable and satellite TV, video, and DVD, as well as the advent of the internet, new distribution opportunities beckoned. In 1993, the chairman of Filmservice International, Rudolf Kammel, initiated a film and video festival focussed on the automotive industry. The concept was welcomed by car manufacturers, film producers, and advertising agencies alike. The first AutoVision Festival, held in Munich in 1993 during the Greger Racing Show, received 52 entries in nine categories. From 1995, at the invitation of the German Association of the Automotive Industry (VDA), the festival moved to Frankfurt am Main and took place during the much larger International Motor Show (IAA). Held every two years to coincide with IAA Cars, the festival changed little from 1995 to 2003. In 2005, AutoVision expanded its categories to include websites and interactive applications, as well as advertising and TV programming. 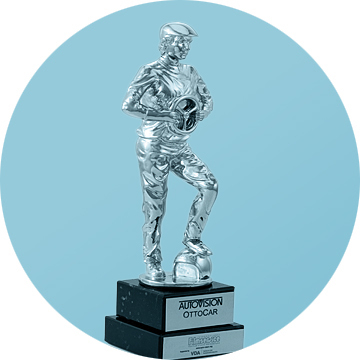 Entries increased as awareness of AutoVision and its prestigious trophy, the OttoCar, spread worldwide. In 2005 the competition received 260 entries from around Europe and the USA, with the new website and interactive media categories proving the most popular. In 2007, the festival received 301 entries and was extended by new categories including video blogs, podcasts and integrated multimedia applications. In 2009, when the automotive industry was in the biggest slump ever, AutoVision faced one of its hardest years as well. Despite these difficulties AutoVision could still welcome 238 entries from countries such as Germany, Austria, The Netherlands, Sweden, Japan, Australia, Switzerland, United Kingdom and Italy. For the first time in its history the AutoVision Grand Prix went to a film from the online category: the innovative viral campaign “Minimalism” from MINI International in collaboration with "webguerillas GmbH" and the "Living Room Pictures" producing company. Therefore in 2011 – when celebrating 125 years of automobile – a second Grand Prix for Interactive & Multimedia was introduced. In 2013 AutoVision welcomed prestigious participants, innovative and qualitative works from all over the world and could achieve a record number of entries in the long history of the festival.